Apparently it’s ESB’s 30th anniversary. Wow, it’s only 5 years older than I am? Somehow I always find it surprising that the Star Wars (original) trilogy isn’t far older. “No, I am your father” is undoubtedly the quote in ESB, but I have a soft spot for Leia’s “Why, you… stuck-up, half-witted, scruffy-looking… nerf-herder!” lol. This one really made me laugh. 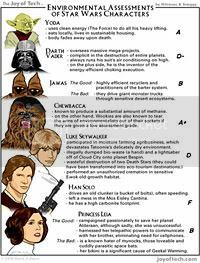 Yoda “uses clean energy (The Force) to do all his heavy lifting, eats locally, lives in sustainable housing, [and his] body fades away upon death” and thus earns an A on his environmental assessment. Vader “oversees massive mega-projects, [was] complicit in the destruction of entire planets, and always runs his suit’s air-conditioning on high” but “is the inventor of the energy-efficient choking execution.” He gets a D-. Click the link or the image to see the full pic. 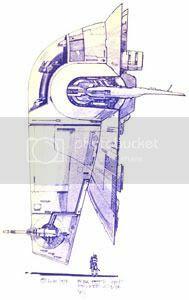 Notes on Boba Fett’s ship from the people who designed it.